Today we’d like to introduce you to Melissa Prycer. Melissa, can you briefly walk us through your story – how you started and how you got to where you are today. Growing up, family vacations always included a few stops at historic houses or museums. But I never really thought about working in a museum until a summer internship at the Dallas Historical Society. After spending a summer in the basement, looking at amazing historic documents (including letters signed by Sam Houston), I changed my major to history and wound up interning at several other Dallas area museums, including The Sixth Floor Museum. After graduating from Hendrix College, I headed to North Carolina State University to earn my MA in Public History. Job prospects were slim, so I headed back home to Texas. In 2004, I joined the staff at what was then Old City Park as the Program Manager. During my decade in the Education Department at the Village, I have launched a lecture series, hands-on classes for children, a preschool storytime, numerous collaborative events, and increased school tours. I was also instrumental in the redesign of the General Store exhibit into a hands-on, participatory space. Among other educational outreach accomplishments, I reinvented the Junior Historian program for teens. Over 40 teens are now active volunteers as the museum and have successfully completed exhibits in the Doctor’s Office and Worth Hotel. In 2014, after a planned succession process, I was named Executive Director. As Executive Director, my work is focused on actively building partnerships with the community, particularly in the burgeoning Cedars Neighborhood and Farmer’s Market neighborhood, improving the visitor experience through reimagined exhibit buildings, preserving local history, and providing a place for curious learners of all ages to discover history. Though we had a succession plan in place from my predecessor, Gary Smith (he had been ED since 1995), it wasn’t always a smooth road. There are always personalities to navigate, and some were hesitant about my leadership capabilities due to both my age and gender. However, without knowing it, we timed the transition exactly right. I was able to quickly take advantage of the pending redevelopment of our surrounding neighborhood–I was the “new” director, even though I wasn’t new to the organization. We’ve been able to leverage political shifts and economic shifts–and in the process, we’re creating a more financially sustainable organization. Alright – so let’s talk business. Tell us about Dallas Heritage Village – what should we know? 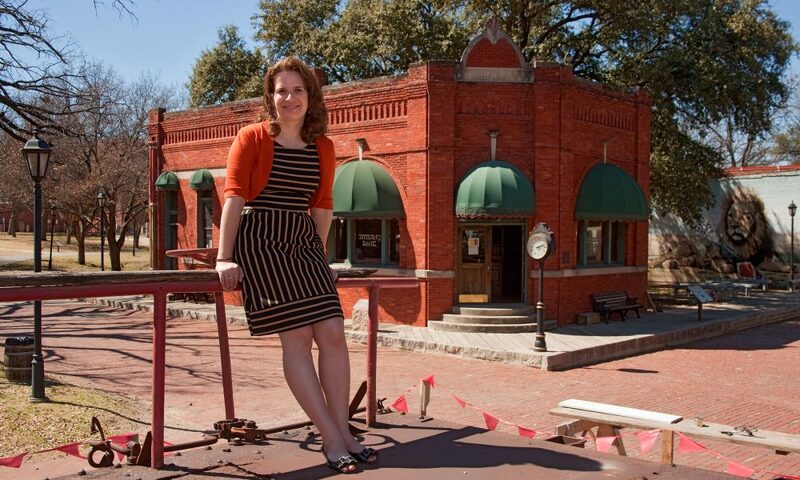 Dallas Heritage Village (DHV) is Dallas’ only immersive historical museum, situated in downtown’s largest green space. The skyscrapers of downtown Dallas that are mere blocks away provide an incredible juxtaposition to the home of over 30 relocated historic structures dating between 1840 and 1910. Sprawling 13 acres, DHV delivers on its unique ability to share and teach Dallas’ exceptional history to over 25,000 north Texas students annually. The Village also provides an open and engaging place for tens of thousands more visitors to relax and enjoy time with family and friends. The Village appeals to curious learners of all ages in a family-friendly venue that depicts life in North Central Texas from pioneer times through the arrival of the railroad. Visitors may select their route in exploring the Village, and park benches are abundant for a go-at-your-own-pace experience. Located in the historic Cedars neighborhood, DHV exists today because of the passionate commitment of Dallas visionaries who came together in February 1966 to save a historic home built in the 1860s. Happy 50th Anniversary, Dallas Heritage Village! The land and buildings of DHV are owned by the City of Dallas, while the non-profit Dallas County Heritage Society and DHV Board of Directors raise $1 million in funding for programs, furnishings, maintenance and management of the museum. In addition to ownership, the City of Dallas provides annual grant funding, contributing approximately 20% to the operational budget. Originally run by volunteers, the museum gradually gained a professional staff. In 1982 DHV became nationally accredited by the American Alliance of Museums, a designation given to only 5% of all museums. Events and educational programming evolved over the decades, while the foundation and heart of Dallas Heritage Village remains in its buildings and all the history they contain. Recent and forthcoming commercial development in the surrounding Cedars neighborhood has and will continue to positively impact the Village. This includes renovation of the Ambassador Hotel, the relocation of the McKinney Avenue Contemporary and Four Corners Brewing across the street, and the building transformation of Ervay and Gano Streets to small office space. Hence, the Village continues to find opportunities to grow and expand, as it capitalizes on its unique location and one-of-a-kind experience in connecting the past with the present. All non-profit organizations exist with the support of many, many friends. We have an active Board of Directors who work hard to both guide the museum, as well as support it financially. The City of Dallas is a key partner and has recently lent support in a number of key ways. The Cedars Neighborhood Association is remarkable in their steadfast support of us. I hesitate to name too many names in the fear of forgetting anyone! However, two of our founders, Ruth Ann Montgomery and Lindalyn Adams, are still with us, still supporting DHV and believing in our future. I continue to be amazed by the vision and foresight they had 50 years ago.